By Deron Wagner|news & announcements|Be the first to comment! Labor Day is time to celebrate your hard work and achievements of the past year. It’s also a fantastic reason to get together with your family and friends to enjoy burgers, hot dogs, beer, and other gluttonous goodies. For the next five days, I am honoring your labor of mastering the stock market with an incredible deal you can’t afford to miss! From now through September 4 only, I am personally giving you an amazing 35% discount off the price of my popular Swing Trading Success video course. That means you will receive my complete, 7-part swing trading video course for ONLY $128 $195. SIGN UP NOW with promo code “laborday2018” to lock in your awesome Labor Day savings. If you want to learn how to profitably trade stocks with a simple, “no nonsense” trading system that works, my video course is perfect for you — I guarantee your satisfaction. 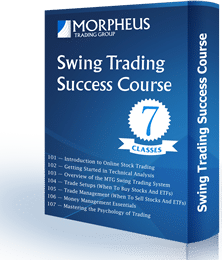 Your Swing Trading Success video course even includes 30 days of personal support with the professional traders at Morpheus. Ask questions until your heart’s content! Please note this promotion expires on September 4, 2018 — I obviously cannot offer you this incredible discount for long. Press here for complete course details and to get started today (remember to use promo code: laborday2018).